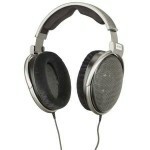 Adorama.com has Sennheiser HD650 Open Headphones for $314.99 with free shipping. The Sennheiser HD 650, audiophiles experience is a truly unique natural sound. With sound this good, long concerts in the comfort of your home are a certainty, so the HD 650 also sets standards in comfort and convenience. The HD 650 is a genuine masterpiece, which will satisfy even the most demanding listener.